Retired due to ill-health, after being absent from work with chronic illness and severe depression. On returning to work after some months of ill-health during the academic year of 2010-2011, I was asked to support the development of the Junior School Library. So, I became the Librarian for the whole of The Dixie Grammar School and moved forward with the plan of integrating the library services across the whole school. Library Online website was extensively edited to reflect this. We also had a range of Web2.0 accounts and I branded these as “Library Online Services”. The refurbished and re-developed Michael Parker Library was opened to students, with an official opening in March 2010. Keynote presentation to the School Libraries Group Conference in Peterborough on Influencing your Senior Leadership Team. Unfortunately, due to family circumstances, I had to cancel some activities – notably for Sheffield University and the LIS at the NEC. Instead, I worked on School Library 2.0 and Web 2.0 applications to develop my skills and knowledge in these areas. This also impacted on the LRC that I ran and fed into the teaching and learning of the school. Presentations for RTA at Reading and Leeds on School Library 2.0. Started a new Blog at The Librain and taught myself about Web 2.0 and School Library 2.0 for a presentation that I was doing for RTA in November. Organised an INSET day for school library staff in Warwickshire in conjunction with the Schools Library Service. I did two presentations, one on Influencing SMT and the other on Virtual Learning and School Libraries. 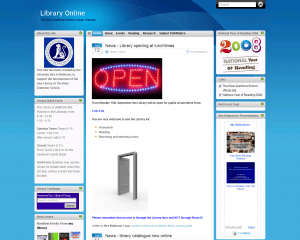 I made a new website for the LRC at NCTC – LRC Online – which enabled us to link to the portal. Presentation to students at Sheffield University about school librarianship: “Making a difference: School Librarianship and Schools Library Services”. Learning Resources and Information Services Manager. This reflected my role in terms of assisting the development of the VLE, portal, website etc. Started the new Strongest Links Wiki for UK School Librarians. Spoke to the south-west branch of the SLA – “From Librain to FLIRT”- about my career leading up to the SLYA 2005 and developments since. Became a governor representing support staff at my school. Took two workshops at the SLA Weekend Course in Bath entitled “Make friends and influence people: how to get the Senior Management Team on your side”. Spoke at the SLG Conference in York. I was not very well, but could not bear to miss the event as it was my last speech as SLYA 2005! Anyway, it was called “Making a difference: celebrating school librarianship”. I wanted to help the delegates feel optimistic about themselves – hope I succeeded. Two Teachers’ TV programmes were shown – they filmed at two schools, including Nicholas Chamberlaine Technology College! The first one was part of the Secondary Libraries series titled “Making the most of the space” and the second “Becoming integral to school life”. Spent a day with a crew from Teachers’ TV, filming our LRC for two programmes on school libraries, which will be shown in January. Spoke at two OfSTED Dissemination Conferences in London and Sheffield on school libraries. The title of my presentation was “Making your school library work – a case study of good practice”. Also did a session for Nottinghamshire school librarians called “From Librain to FLIRT – ten steps to School Librarian of the Year 2005”. And no, that is not a misspelling! Promoted to a new post. My school “federated” with Ash Green School, Coventry, and I was asked to help develop a new LRC at Ash Green whilst continuing with my work at Nicholas Chamberlaine. My new job title was Federation Learning and Information Resources Team Leader – check out the acronym! School Library Association Weekend Course – Knowledge is Power. One of the best courses I ever attended. Took two workshops on Information Literacy. The special dinner on the Saturday night, sponsored by Walker Books in honour of their 25th anniversary, was also a great occasion. The SLA invited my husband and boys and I even managed to make a short speech (after a glass of wine or two)! School Librarian of the Year 2005 – presented with the certificate and a signed Raymond Briggs print by the famous Anne Robinson. I had a fantastic day out at Pinewood Studios and Le Petit Blanc in Oxford, thanks to Kathy Lemaire and Alec Williams of the School Library Association. School Librarian of the Year 2005 Honour Roll – presented with the certificate for this by Aidan Chambers, President of the School Library Association, at the London Book Fair. Speaking at a training day for Walsall School Librarians. Asked to take over as Web Editor for the CILIP School Libraries Group. Assessed for the School Librarian of the Year Award Honour Roll by representatives of the School Library Association. Attended my first meeting as a co-opted member of the School Libraries Group Committee. Spoke at a workshop on collaboration between librarians and teachers, organised by Sarah McNicol and held at UCE. Wrote article for the Online Supplement of the Times Educational Supplement. Very pleased about the reaction and the photo! Asked to write piece on “My Favourites” for the NgFL. Started a new support website for school librarians, Strongest Links, which was very well received. Learning Resources Centre Manager, Nicholas Chamberlaine Technology College, Bedworth, Nuneaton, Warwickshire. An 11-18 comprehensive school with about 1500 students, one of the largest in Warwickshire. School Librarian, The Margaret Glen-Bott Secondary School, Wollaton Park, Nottingham. An 11-16 inner-city mixed comprehensive school with about 500 pupils. During this period I was not in paid employment but bringing up our two children. School Librarian, Carlton Le Willows School, Gedling, Nottingham. A suburban 11-18 mixed comprehensive school with about 1500 pupils. School Librarian, The Manning School, Aspley, Nottingham. An inner city 11-16 girls comprehensive school with about 600 pupils. Assistant Librarian, Nottinghamshire Education Library Service, Mansfield Library. BA Hons Ancient History and Archaeology, Birmingham 1978; MA Ancient History and Archaeology, Birmingham 1980; MA Librarianship, Sheffield 1981. Graduate Trainee year at Lancaster University Library 1979-1980.